I used to want to fix people, but now I just want to be with them. 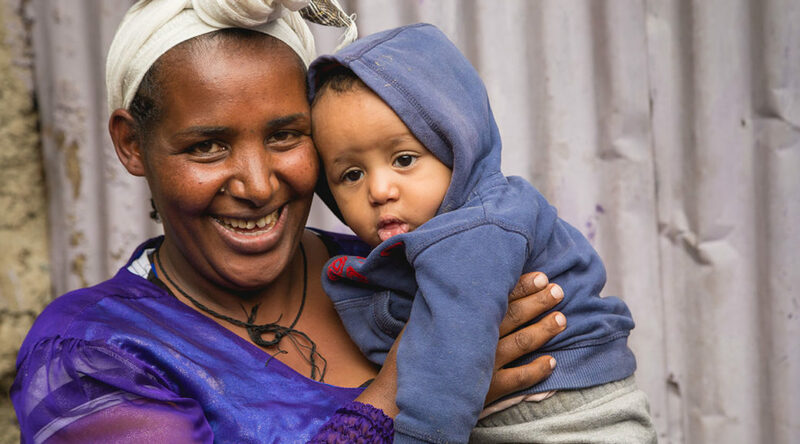 I prayed a lot about returning to Ethiopia this year. I wanted to go back but was unsure and scared that it wasn’t necessarily what God wanted me to do. It is the hardest time of year for me to leave my job and family. After a lot of prayer and talking, I decided I would tell our church I wanted to return if they would have me back. In addition to being away, I was concerned about the financial portion of the trip. I had been blessed by so many generous people last year and knew I would need to fundraise again to be able to go. Two weeks before leaving, our family was blindsided by a cancer diagnosis for my father-in-law, which lead to major brain surgery and a stage four diagnosis. Timing again kicked me when my oldest son was scheduled to leave for the Army the day after I was leaving for Ethiopia. I once again was rethinking if I was supposed to go. It started to feel like the worst possible time to leave my family and emotionally wanting to be with them. Had I convinced myself God wanted me to go when really it was my want?! God provided once again generous supporters to help me. Trusting that God had answered my prayers and provided for me to go, I headed to the airport on Saturday morning the 14th at 10:45 in the morning. I was so anxious and almost nervous as we drove up to Bring Love In and the school to see the kids on our first day of teaching. Would they remember me?? Was I worthy from last year to be remembered? Would they be excited to see me? 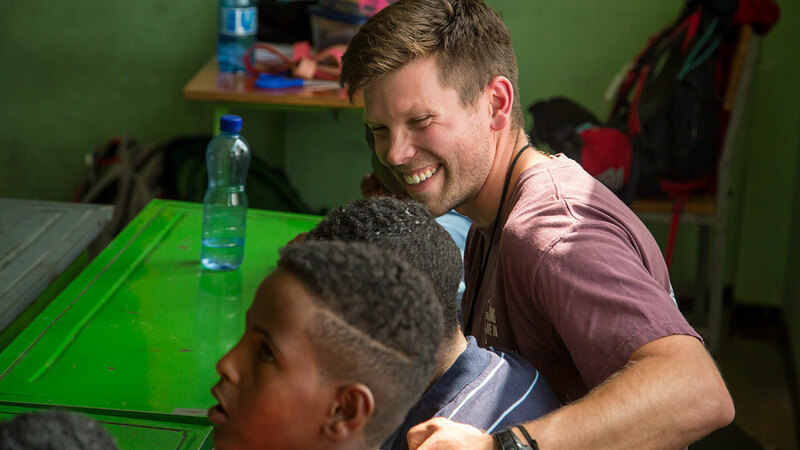 Would I have just been another missionary who came to Ethiopia or did I truly show the kids that I loved them! Did I convey to them that they changed my life more than I could have ever changed theirs! There’s no hiding that last year these kids stole my heart and showed me what true joy looks like. They showed me how big our God is and how He can transform and change your life. Right away the smiles and welcomes proved that they had been anticipating us coming and were so happy the day was finally here. 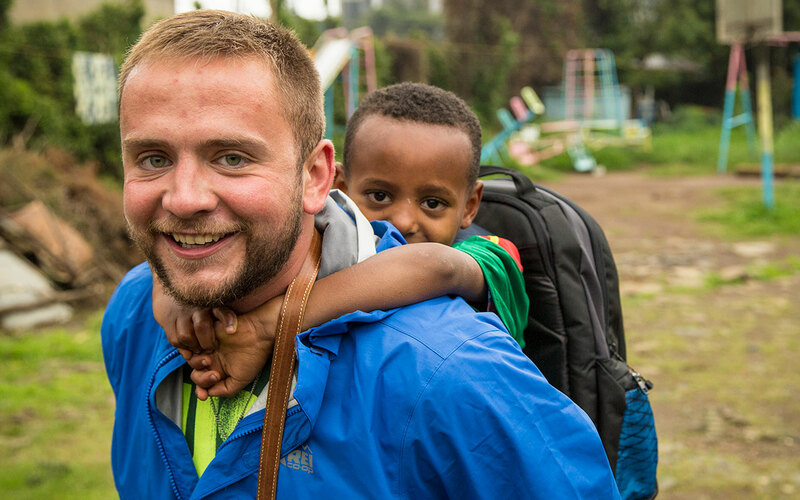 The familiar smiles and hugs were confirmation of my purpose here in Addis: love! It was quickly confirmed that this is where God wanted me. I’m here to love these kids, not just teach them but show them God’s love through me. 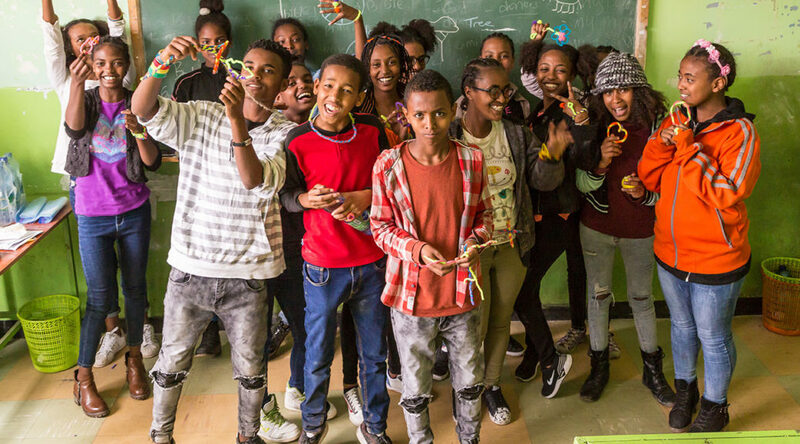 I came back because these kids and people of Ethiopia have broken my heart in ways I never could have imagined. Over the past year, God has not only placed Africa, poverty, and orphans on my heart but he has also started to chip away at things in my life He wants me to change. Places that I need to work on to better serve him. Someone said this morning in our devotion time that with God’s blessings come responsibility. I have a responsibility to use my blessings to bless and serve others. 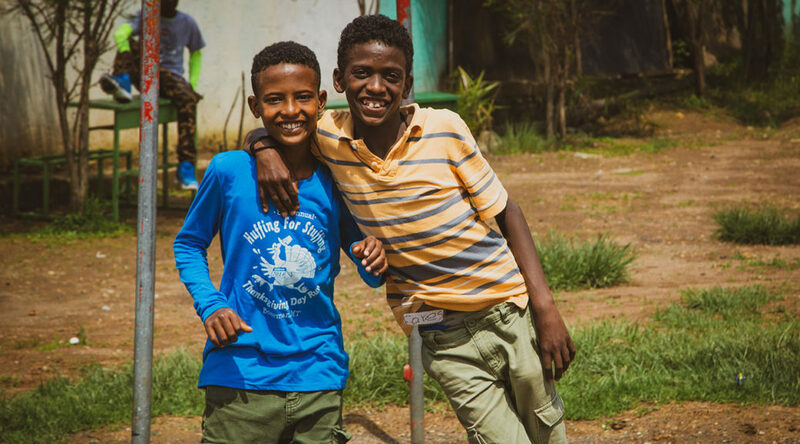 I am forever grateful for the opportunity to be in Addis not only once but twice. Now it’s time to carry out His mission for me back home. H Humbling. Why God, do I live in America? I live to play a role in God’s story, it’s His story, not mine. 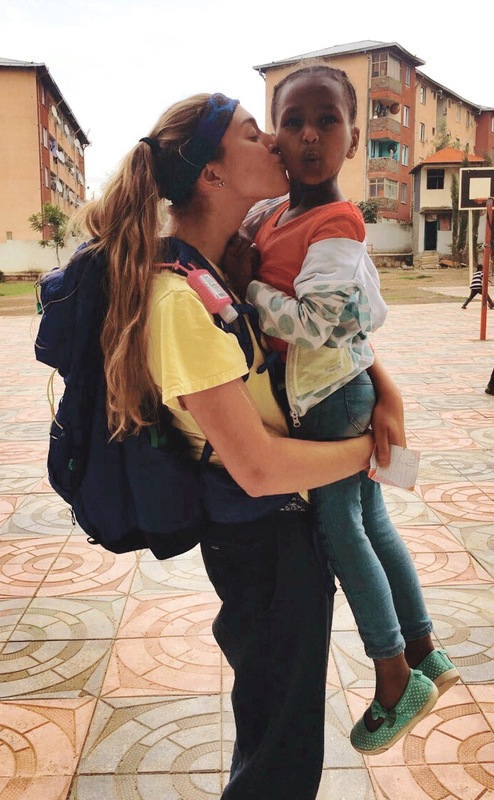 One year ago my daughter, Malea experienced Ethiopia for the first time. As a father you are always looking out for, protecting and guarding your little girl. Ethiopia was not the plan I had for her. Yes, even though we planned for this trip, it was not supposed to be this way! Three weeks prior to her leaving the tragic death of my son and her older brother, came to be. This wasn’t the plan! 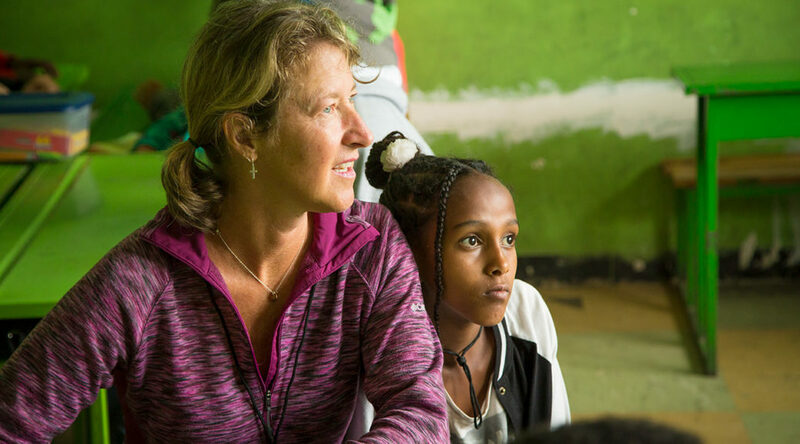 Her Ethiopia trip was supposed to be the culmination of excitement and preparation. One year later I’m here with my wife and daughter wondering what’s the plan? Why am I here? As we were visiting the children, on the second day at Bring Love In, I was asked to teach the Bible lesson. The lesson for the day: “God has a Plan for you” and “You are God’s Masterpiece”. So humbling to try to teach kids who have lost way more than me the truth that that needed to hear. I hurt as I realized the pain they have gone through yet telling them that this God’s plan for you and you are God’s masterpiece! Wow, am I believing this? Truth be told, NO! But that’s God’s plan for me. To take me way across the world, to an unbelievable place (I would explain but you wouldn’t understand) called Addis Ababa. He took me here to teach me the lesson I was teaching so I could relate with these beautiful kids, so I could truly break with them. All these thoughts and emotions hit me hard while I was teaching them. I know the lesson is pretty elementary, right? Sorta “Sunday School-ish”. But truth is, when I saw these grade schoolers repeating back to me in unison: I am God’s masterpiece and God has a plan for me, I realized, that was God’s plan for me to hear that. Even if he had to take me worlds away from comfy Bozeman. Do you believe: You are God’s Masterpiece and that God has plan a PERFECT plan for You? How’s about when life gets tough, REALLY TOUGH? If not, I know a group of kids, wait. I know a group of God’s Masterpieces that are willing to teach you! Driving in Addis is like nothing I have experienced. The cars all drive so close to each other, there are no traffic lights or signals, and if traffic is jammed the vehicles just hop on the sidewalk and move forward down the road. It’s wild – I watch just waiting for someone to collide with us, but the river continues to flow. It looks like chaos from an outside perspective but it works. As we continue there are cars coming in and out of the lanes, barely missing each other, what is happening? I am constantly fighting the idea that this works. How can something work like this without structure or control? You watch them drive and there is no anger, no stress, no road rage, they just work together giving each other a courtesy honk and letting them in. It is like nothing I have ever seen before, but amongst what seems like chaos is actually nothing but love. Time is not relevant here, it’s beautiful. As I sit and watch all that is going on around me, God’s presence overwhelms me, it is so real. I find myself wondering what can I learn from these amazing people? I watch this river of traffic wind around and snake through narrow side streets, and I think to myself, “there is way too much control in my life”. Time controls my life. I always try to work hard and carry the weight of the world on my shoulders. I am strong. I can handle it. But in the midst of it all, I am left forgetting the strongest part of my life. God. He is always there and he has a plan for me, instead of gripping the reigns and trying to be in control, I just need to let go and pray for guidance. As each day fades, I see God’s image in all of the people we see, and in everything they do. I see it so clearly now. The time they take to truly listen, truly be part of the conversation. riding with Ephraim has been such a bonus to this trip. He has so much to tell us about his beautiful country. One day while traveling down their busy streets, he turns back so excited to tell us this story. Right in the middle of the best part, his phone begins to ring. One ring after another, he continues his story. I begin wondering to myself is he ever going to answer it? He doesn’t skip a beat, our conversation continues. The time spent together was more important than any phone call. There is something we can all take from that. Take the time, it can wait, God is with all of us and the relationship we have with each other. Loosen the grip time has on our lives, shut out the world and find the love and spirit within each other. Put time and control in the rear view and truly be a part of the relationships we build together! Be. Not. Afraid. Growing up, we all have our security blankets. Whether it’s a literal blanket that we carry around, or maybe a parent or a sibling, we all feel a constant need to feel safe, comfortable – in control. For me, my security blanket was my family. I was extremely blessed to have two very Godly men as my role models in my Grandfather and Father. I spent countless hours playing catch with my Dad, and spent days doing nothing but playing games with my Grandpa. I’ve taken trips to hardware stores, banks, and more notably – carwashes. See, my Grandpa had this old 90’s blue pickup truck with a black topper on the back; I can still see it like it was yesterday. Well, he would go to the carwash, all us kids would pile in the back of the pickup so we could watch the water as it hit the windows. And I remember, going through the wash, water would begin to spill into the bed of the truck through the bottom of the topper. We would all scream and scream and bang on the windows, telling my Grandpa to stop (this was one of the self-use power sprayers). He just smiled, whistled and kept on his way pretending like he’d forgotten all about us. We all just screamed with glee – no fear, just carefree abandon because we knew that my Grandpa was in control. I think we often forget that, just as my Grandpa was in control that day, we always have a heavenly (Grand)Father who is in control of our lives at all times. I know for me, two weeks prior to this trip, the reality really started to set in, and with it came all of the fear and anxiety. Fear of not fitting in and having a place with the team, fear of leaving the country for the first time, simply put – fear of the unknown. For months and months this was just a date on my calendar and suddenly it was becoming real. I started having minor panic attacks, couldn’t sleep; I felt so overwhelmed. I didn’t have any control, I no longer had my security blanket. Luckily, we serve a God that knows us intimately, and knows our every need. Jesus reminds us in Luke chapter 11 that we need only “seek and we will find, knock and the door will be opened to us”. As I prayed and countless others prayed over me in preparation for this trip, I felt like my anxiety couldn’t be overcome. But I continued to seek, and I continued to knock, and boy was he faithful to his word. As I said before, my Grandpa has always played a huge role in my life. And in the past ten years or so as his health was beginning to fade I got the idea to get a tattoo of a cross with his birth year and death year on my shoulder when he passed away. For a long time, that day seemed like it would never come, but eventually his health gave out and he passed away in May. I immediately started thinking of my design, and I really wanted to incorporate a scripture. For some reason, the verse Joshua 1:9 kept coming to mind. It was God’s reassurance to Joshua as he took over for Moses that he needn’t be afraid – he just had to trust in God. God would be his security blanket. Just like my Grandpa with the sprayer, Joshua could take comfort in the fact that his heavenly Father promised to be in control. Now, I’m not normally a reader – I think the last time I finished a whole book without the help of spark notes was my Freshman year of High School. But I also know that I can’t sleep on flights and I didn’t want to waste a 14-hour flight watching movies and likely getting motion sickness. So I decided I would take on the challenge and read an entire book by the time our flight landed in Dubai. As I was scrolling social media, I had seen a friend reading a book by Bob Goff called “Everyone Always”. I had seen lots of his TED talks and loved his message, so I figured it would probably be a good bet. It’s funny how what we often times view as a subconscious decision, God has as a major part of his plan – this book was a perfect example. I was immediately drawn in by his description of living an authentic life of love. It was as if every thought floating in my head that felt trapped and inexplicable was right on the pages in front of me. Story after story, I read of what true Christ-like love looks like, and witnessed an example of an authenticity that I’d never seen before. People describe “God moments” in a number of different ways. Some hear an audible voice. Others describe a calmness coming over them. For me, my God moment was three words: Be. Not. Afraid. As I read those words, tears instantly began streaming down my face. It was as if my Grandpa was right there with me, at the start of this new unknown journey – God had given me my security blanket. Be. Not. Afraid. As you read this post and go out about the rest of your week, I encourage you to remember those three words. 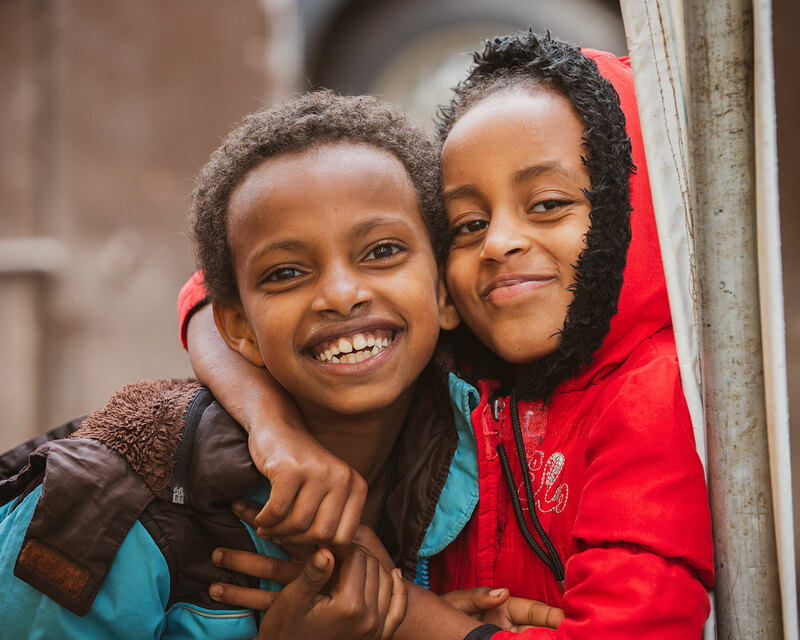 Remember that we are called to love, and no matter where you are, you always have your ultimate security blanket with you; even all the way in Addis Ababa, Ethiopia. Fear built up inside me while sitting in room 3 of the Guest House, my bedroom, when the lights suddenly went out. Just moments before, I was i the middle of a text message to my mother. I was about to press the send button when the WiFi bar usually placed at the top of my screen vanished. A lump developed in my throat and tears welled up in my eyes as I realized I had lost connection to my loved ones back home. This is how the morning of my first day in Addis Ababa began. In a house full of (at the time) strangers in a completely foreign country, I sat on my bed holding back tears feeling more alone than ever. I struggled to pray and regain comfort because all I could hear in my head was my own voice saying “I shouldn’t be here, I need to get out some how.” My morals kept me from leaving, but my instincts screamed at me to buy the first plane ticket home. At this point I had yet to actually let a tear drop from my eyes. I couldn’t let a team who barely knew me see how broken and weak I was without my family. I continued to get ready for my first full day in Addis and stayed pretty quiet all morning. At 6:45 we separated into our two teaching groups for daily devotional. I quickly realized everyone was expected to share even a small bit during this time. More anxiety washed over my mind and heart. I wouldn’t be able to share even the slightest bit without crying. When I felt called to share, I didn’t just speak, I poured out every feeling I had balled up since our plane left the runway in Belgrade. Stephanie placed her hand on my leg and Beau’s hand rested on my shoulder as I began to weep. Without even trying, my first few connections were made. Later that morning we piled in the vans to transport ourselves and the supplies to the school for the first time. Although I was beginning to feel better after opening up to my team for the first time, I still felt anxious about the remainder of my trip. That lasted a short lived 40 minutes in the van and was swept away immediately upon entering the school. A bus full of kids poured into the halls. Some running, some walking, the kids approached us outside the classrooms. 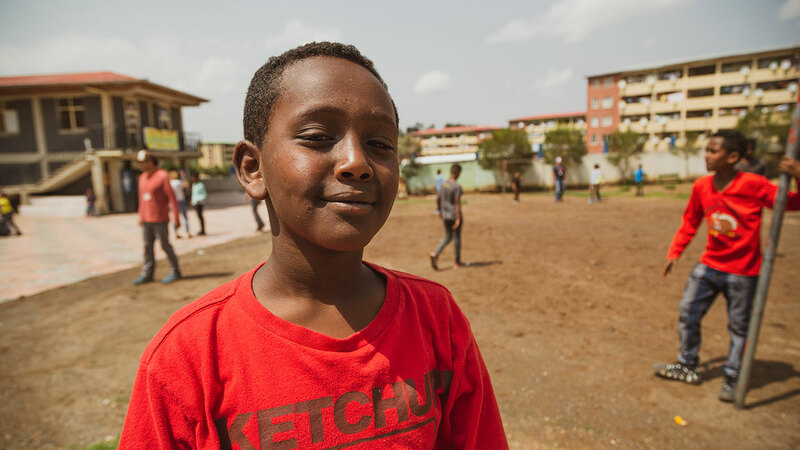 Keep in mind, this is my first time in Addis and unlike many others on my team, these kids do not know who I am. Nevertheless, the first kid, a boy named Akele, grabs my hand and pulls me towards him for a hug. Another boy repeats the same actions, his name being Fares, and asks me my name. This pattern continued until I had met and hugged nearly 25 children in a matter of minutes. All so eager and excited to see me without even knowing my name or who I am. I was a stranger to them yet they immediately let me into their lives, let me make a connection with them. This has not been the trip I expected. But it has been the trip I deserved. What that means is I have been sick from the moment we have landed. Unable to hold down any food and unable to eat the dinners for the first few days. I tried to tough it out. Until I finally had to wave the white flag. Take my Zpac. Rest and recuperate for a day. And that was the last thing I wanted to do. The reason this is the trip I have deserved does not come from the sickness, but I have been closed off to My Savior for a long time. Not in the sense that I don’t want to be in a relationship with Jesus. But that I haven’t felt the need for Him. 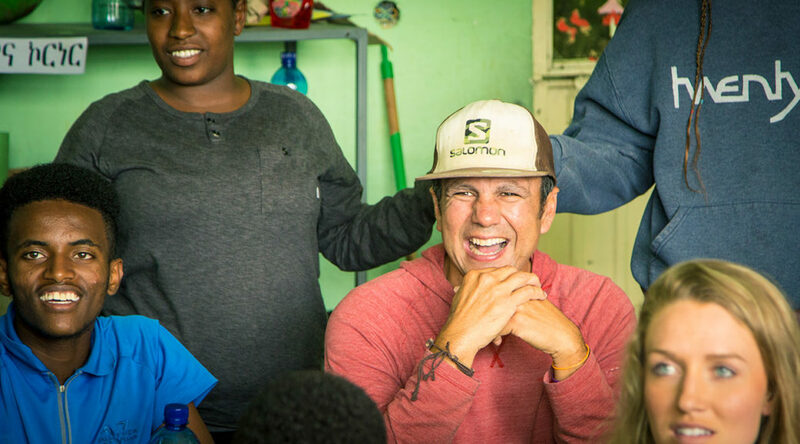 During one of our morning devotionals where I was feigning health and positivity, a leader said so simply that on missions trips or in ministry, anything you do over again will not be the same as the first time. 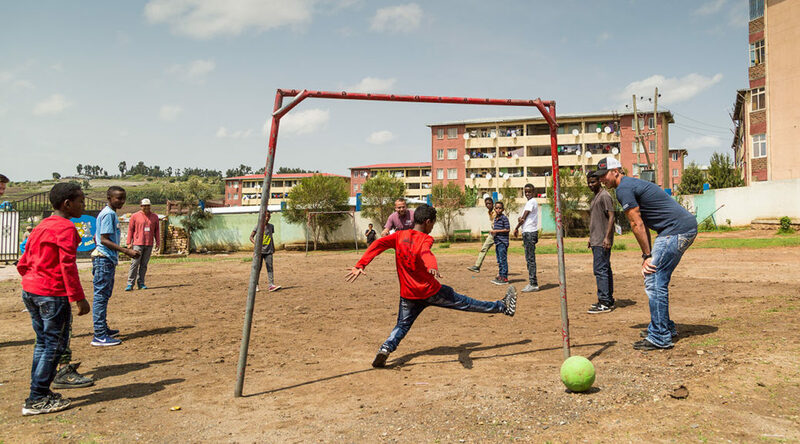 Returning to Ethiopia, I was expecting to be easy-going and care-free when it came to the food and culture of Ethiopia again and instead I feel like some of my teammates probably did last year, sicker than they hoped to be. Naturally tearing up, having to stay behind and watch as the rest of the team left for the day to see beautiful smiles and unwavering love. And where as I didn’t have the compassion for them last year. I do now. But as for God. I do not pass blame or ask for simple healing. I just know that this soon will pass. And pass it did. More pertinently, the lesson I have learned from my time under the weather here is that I have to turn to Him. In the U.S., I can so easily work out if I feel negatively about my body. I can relax if I feel stressed. I can show affection to my wife (or dog) to feel loved back. But what I was missing was a true healing. A daily healing. Where my sickness is not something I can just lay at home in Bozeman and ease through. This situation has shown me that though God’s plans are firm, they are by no means fun all the time. I had to rely on prayer that I would be able to spend time with the kids, with the team, and not just in my own sickly confines. My prayers have been answered. 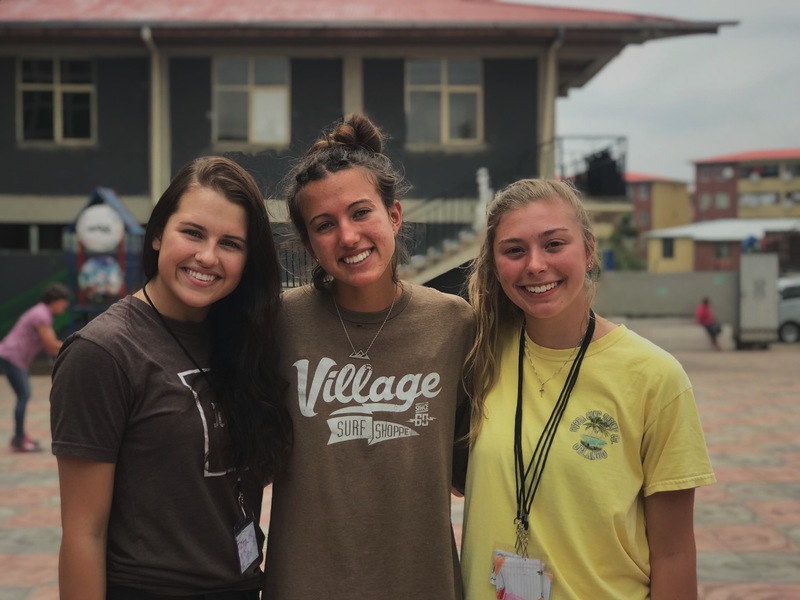 I have a week left to pour love and affection into the kids of Bring Love In, my teammates experiencing this place with me, and back into my God. Driving to the school on our first day with the kids filled me with worry. I was so excited to see the children, but my anxious mind wandered to questioning whether or not these kids were feeling the same way. 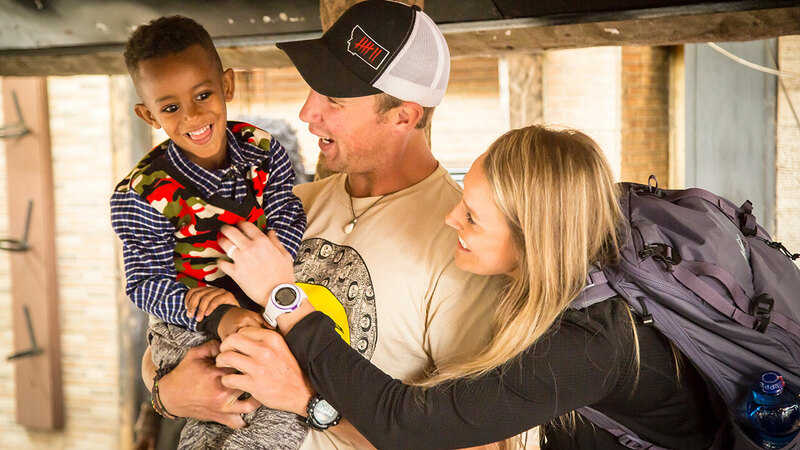 I was scared that the kids would cling to those on our team who had been previous years. I knew it was a silly worry, but I couldn’t push it out of my mind. So I prayed. And I prayed. And I prayed. Within a minute of the children arriving I knew that my frantic, scared mind would be put to ease. The tiniest girl came running up to me and wasted no time making me her best friend. We HAD to sit together every day, no exceptions. Our pictures HAD to be color coordinated. We became inseparable. Sitota is a ball of fire, energy, joy, and LOTS of sass. Her facial expressions are second to none and her smile… the most beautiful sight I’ve ever seen. I couldn’t believe that I could love a child so much, yet here I was, tearing up with every goodbye. As we left the school one day, Sitota and I wandered over to our driver Ishy, and he explained to me that the name Sitota meant “gift”. It’s impossible for me to imagine a greater gift than this child and her relentless love. This child stole my heart (and my watch) a million times over. God’s timing is always perfect, and tiny little Sitota was the most precious gift I will ever receive. All I can say is God is so good and I am beyond blessed to be here! 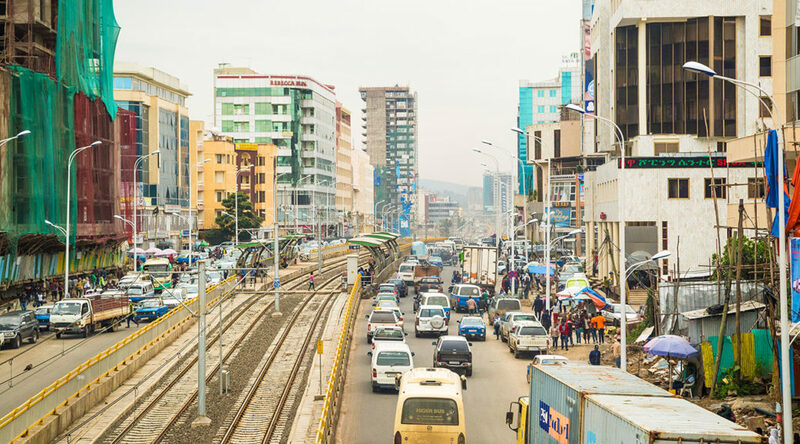 Addis is a bustling hub of Ethiopian life. Everywhere you look there are people, animals, cars, and trucks going about their daily lives in an indescribable harmony that becomes oddly comforting after soaking it all in for a third year. What I’m struck by this trip as we go about our travels are the walls, and the gates. Houses, huts and businesses are stacked side by side and back to back separated by a wall, and a gate. Everywhere. I look and wonder. Wonder why all the walls and gates? To keep things in? To keep things out? To indicate ownership, to define boundaries, for privacy? Yes, I realize, all the above. 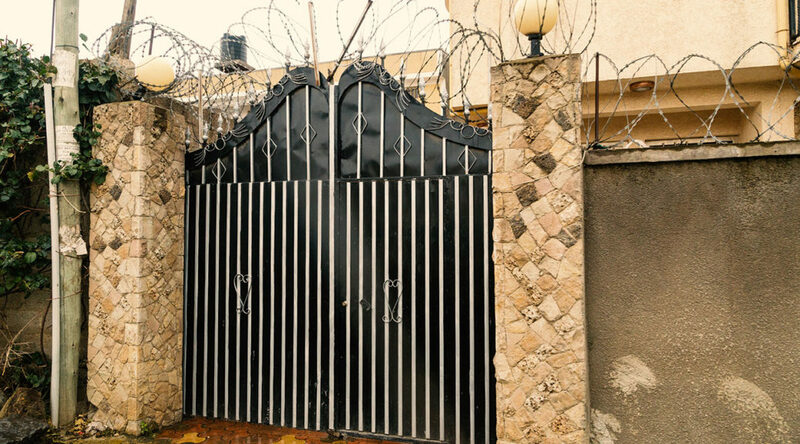 The families of Bring Love In (BLI) live in houses behind walls and gates in the neighborhoods around BLI headquarters. 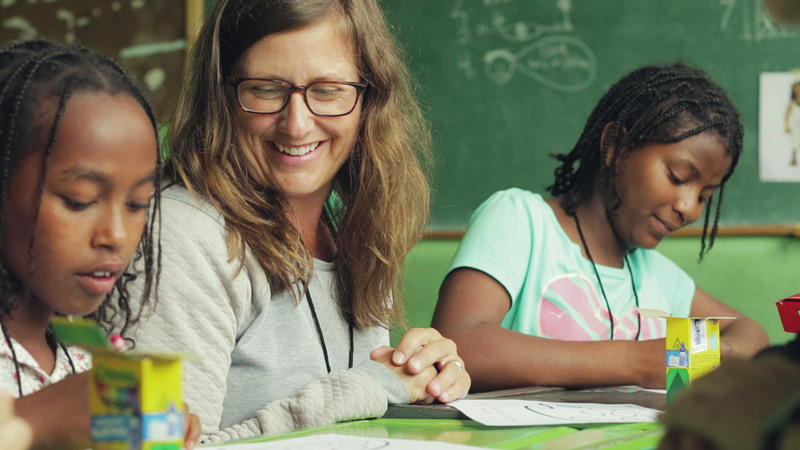 This creates a sense of family independence while, at the same time, proximity (walking distance) to allow the incredible staff at BLI to do their critical work helping the kids and families thrive. And, thrive they do. It’s inspiring, humbling, and evidence of God’s hand is everywhere. But, I wonder what God thinks about all these walls and gates? I suppose that depends on what they protect, what they keep in and what they let out. 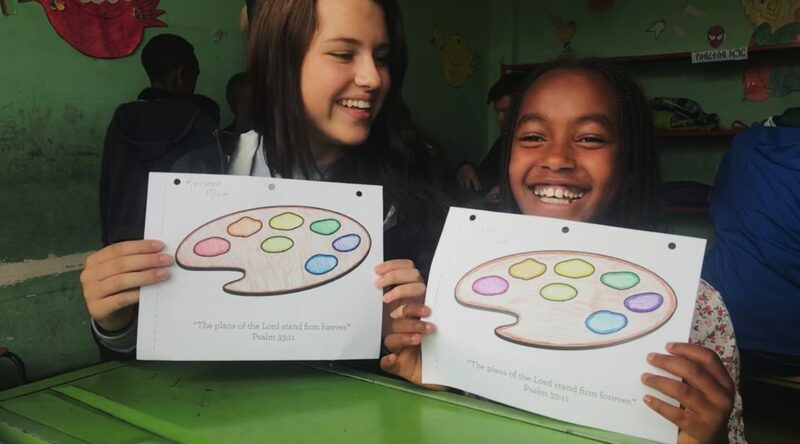 Back home, someone on our team shared they wanted to feel the God they feel when they’re in Ethiopia. At the time I thought it was a nice thing to say, but, really, isn’t the God in Ethiopia the same God in America? The answer is yes. But, He has a lot more competition for our time in Bozeman than here. We’re very busy people with deadlines, calendars, bills to pay and Jones’s to keep up with; not all bad of course, unless all that stuff gets in the way of our relationship with Him. I suppose that’s where walls come in. Lord, build walls in my life to keep the busyness, competition and desire for more away from my heart as I long to know you the way these families know you. We are here with these kids for two short weeks. But in that time with intermittent electricity and dial-up speed some-of-time Internet, you feel many of the distractions of life back home slip away. You rejoice when there are a few drops of lukewarm water in the morning shower. In fact, it’s praise time that you get a shower! But, what fills that void left by the absence of TV, smart phones, pets and Facebook are relationships. Relationships with the people around you, the families you spend time with, and, most importantly, God. There is a difference between how I experience God here and how I do back home. But, I realize now that He’s been the same all along, it’s me who’s different. It is, at the same time, wonderful and a bit sad. I need a few gates to open and close. Lord, I pray that you will close the gates to distractions and things that keep me from knowing and following You in a more meaningful and intimate way and, to open the gates to meaningful relationships that really matter with family, friends and You. So, what’s my plan? It’s simple but difficult; prayer and choices. Prayer for strong walls and well-oiled gates that I open and close as the God I experience here in Ethiopia desires me to do back home. This year he asked me to come along. My initial response was “No”. How could we possibly leave our four children for two weeks? How would they survive without one of us to parent, to take care of their every need or control how their days went? Really what I was more concerned with was controlling my life. After many discussions, much praying and planning and a bit of worrying I said “Yes” to accompanying Brandon to Ethiopia for his third trip. God in His infinite wisdom knew I needed to be here and see this remarkable country and meet these beautiful people. I am humbled that I get to be here. 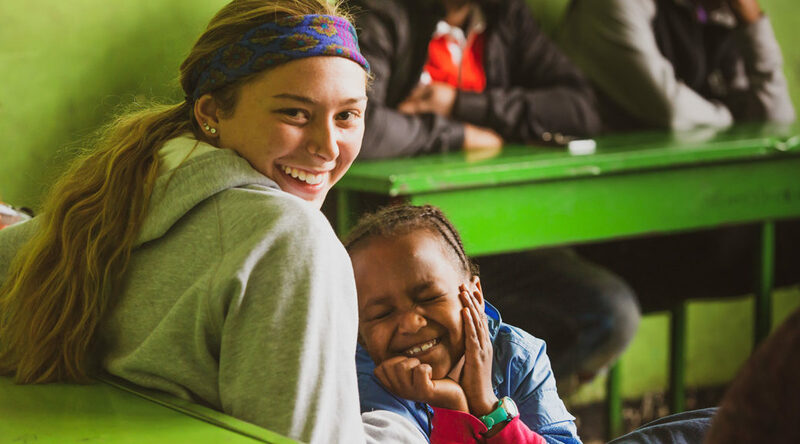 I have cried tears of joy as I am experiencing this place and its people, being with the Bring Love In children. 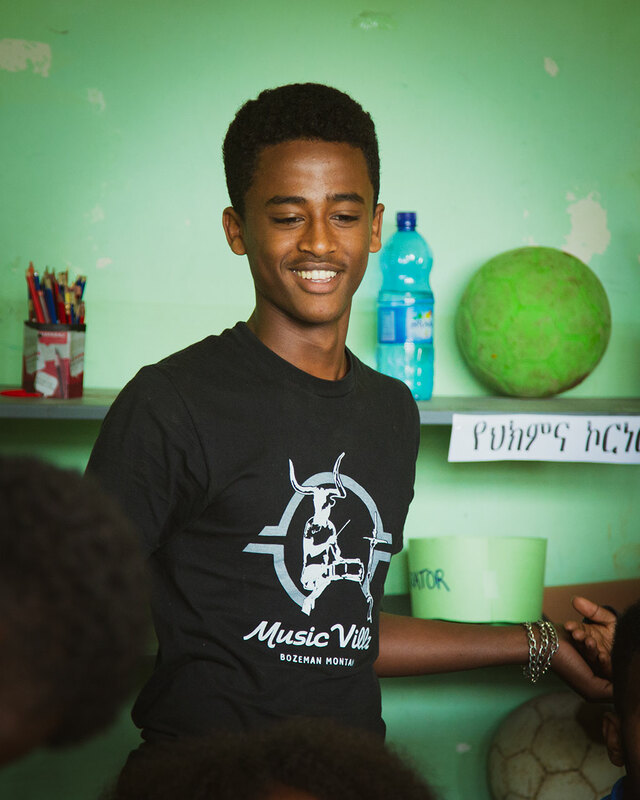 I have wept in my bed at night as I think of the Ethiopian people who have humbly served me. I am praying for God to continue to soften my heart. Recently, back at home, I was quite upset by what was going to be built across the street from our home—it will block my view of the mountains. Ugh. How gross. My easy life has given me a very warped view of reality. Is this the reality that God wants for my life? Speaking of my daily life, I love my children very much but as I reflect on my parenting many times my prayers have been for success and ease of life. I am more concerned with what extra-curricular activities my kids should participate in than how to disciple them and show them the fruits of the Spirit. Again, ugh. In Jesus’ Sermon on The Mount he calls us to be the salt of the earth and the light of the world. He says, “In the same way let your light shine before men that they may see your good deeds and praise your Father in Heaven.” I want our four kiddos to see us live out a faith that follows what Jesus called us to do, love people, love widows and orphans and “be perfect as your heavenly Father is perfect.” This will be impossible but it is what I want to pursue. A sermon I recently heard, the pastor said “Love is how success is defined in the Kingdom of God”. Sadly, I miss the chance to love others, more often than I would like to admit because I make up lame excuses or chicken out because it could be awkward or ignore things because it will get in the way of what my heart desires. On the 14-hour plane ride to Dubai, I sat next to a kind Ethiopian man named Solomon. He was talking about the humanity in their new Prime Minister. Humanity. I have been stuck on this word since then. Humanity means “the quality or state of being human•compassionate, sympathetic or generous disposition”. These are the traits that are to define us as human beings. How do I get it so wrong? Is my life defined by these human qualities? Dear God, Forgive me for not loving people well. Forgive me for not being compassionate, sympathetic or having a generous disposition. Forgive me for my fear. Forgive me for storing up my treasures on earth. Please change me into a person more like your Son. You are a good, good Father. You are perfect in all of your ways.